To say I was excited to see my COMC order arrive the other day would be an understatement. If there were two cards that were on the top of the "can't wait" list....it would be these two. One is a crazy tough parallel that I've been trying to track down for over 15 years and the other is a card that I didn't even know existed until recently. Both have fun stories so sit back end enjoy. At first glance this card looks like a simple, boring (but still important) base card. Nothing to write home about, right? Let's flip the card over. You can see the numbering in the top left says NY17....not the normal 117 that the card is usually associated with. This is (according to what I've discovered...someone correct me if I'm wrong) a magazine insert card that was released on an Islanders game day. 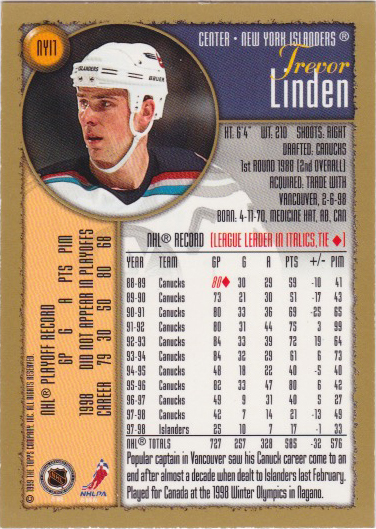 I knew that this card existed, and was even shown a scan of it years ago by a fellow Linden collector. Having never seen one - and likely never would - I just chalked it up to a card that just wouldn't surface. So what must I have thought when I saw multiple....MULTIPLE copies of the card on COMC a few months back? Craziness!!! Where did they all come from? Why aren't they listed for a hundred bucks a piece (I might have been crazy enough to spend that kind of dough..........ok, maybe not). But what the heck???!!! I quit asking questions and put an offer in on one (hey, why not try to talk the seller down on the price...after all, he has multiples). I am super pumped. What a great add to my collection. Now if that wasn't exciting enough, I also picked up a card that was originally never created. For reals. Let's start with the front of the card again. Why Kesler is on the front just makes no sense - even if the whole idea is "back to the future" and there is actually a reason for it. Me no like. Anyways, when Panini released it's Limited product in the 2011/12 season, the checklist indicated this dual auto card. But for months not a single sniff of one. After a couple years it was determined that the cards were never produced (or so we thought) and that they can come off the master list. 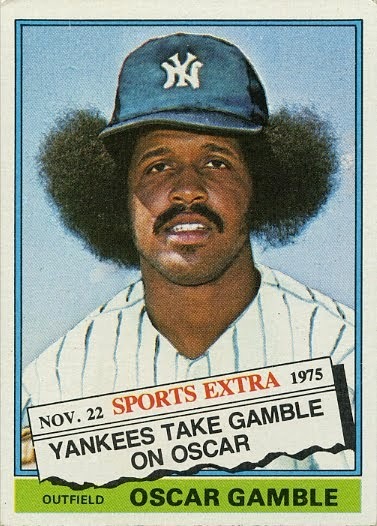 Well, fast forward a few years and a copy of this card pops up on eBay. I was stunned. I immediately contacted another Linden collector to try and figure things out. He was as stumped as I was. But that didn't stop him from purchasing it. 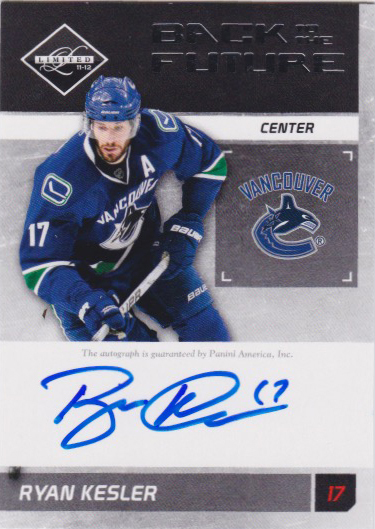 It wasn't until after that it was revealed that the 25 copies of the Kesler/Linden auto - and the platinum 1/1 parallel - were released straight off the Panini website. 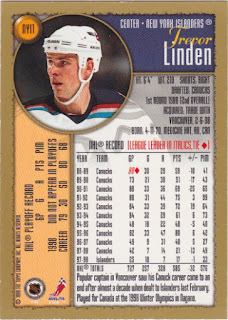 I think it was a product dump as the company was no longer going to be doing hockey cards. Little did I know that one person picked up all the copies. 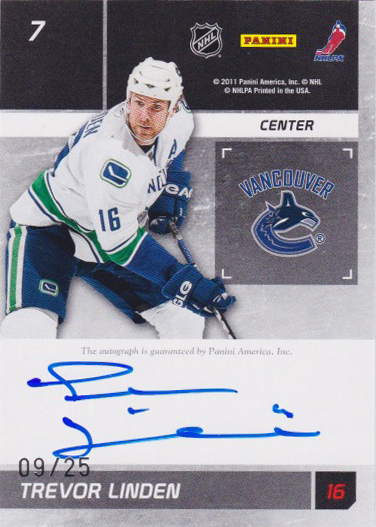 Because over the next few months, new copies of this card would constantly be popping up. So I shifted from "gotta have it" to "I think I'll wait". Card went from over $60 to $40 to $30 to $25. Multiple copies have been sitting on COMC with no action on them. I tried to get the seller to come down below $20 (as he had multiples.....who's going to buy all of them?) but to no avail. Finally I decided that the few extra bucks were no longer worth it. It's still a tough card to track down, numbered to just 25 copies and is hard signed. Now that I can see it and touch it in person, I'm thrilled to cross this one off the list. What a great pair of cards to finish off the year with (I'm assuming these will be the last big pickups of the year that arrive before 2017). Love this! 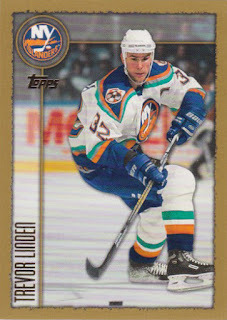 As a hockey player collector myself, I have come across some frustrations finding cards that it seems shouldn't be so tough to find. This gives me hope! Two great cards with two great stories to accompany them. The Kesler Linden dual auto is one sweet looking card. Congats on the additions to your collection.